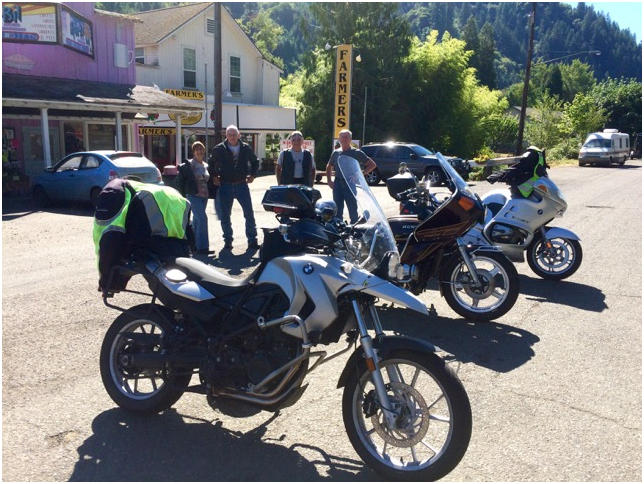 Bob, Doug, Floyd, Fred and Gladys stop for a saddle break in Mapleton. The morning of July 30 dawned like many, with a weather forecast predicting high temperatures of near 100 degrees. "No problem," I thought; we heading off on a group ride to the Oregon coast for lunch in Yachats at the Green Salmon Bakery. We grouped-up at the Shell station for fuel, and booted the side stands at 9:00 a.m. sharp. Off we went. Riding west on Route 126, a quick stretch of asphalt north through the tree canopy on Poodle Creek Road, a left on Highway 36 to Mapleton, and then into Florence. All went well, and the temperature warmed into very pleasant upper 70’s. As we headed north, up Highway 101 between Florence and Yachats (along that big blue body of water called the Pacific Ocean) the temperature began to drop. A small bit of fog shrouded our ride, lightly glazing over a lovely blue sky. The temperature on my dash display steadily slid to 58 degrees. A definite chill cut through my summer ventilated jacket and I, for one was uncomfortably cool. I was very happy to pull into the parking lot of the Green Salmon. Ah, to be a reptile. A side note here: I always enjoy the Green Salmon Restaurant. They have an extensive menu of vegan, vegetarian, and non-vegitarian options for us carnivores. If you want to get one of their semi-famous maple glazed croissants, you must get there early. Once gone, they won’t appear again for 24 hours. If you check out the Green Salmon on line (www.thegreensalmon.com) make certain to note their hours of operation. They close each day at 2:30 p.m. The best news last, they roast their own coffee. Always delicious. After a very satisfying lunch (and belly’s full of hot coffee), we turned our machines back south on Highway 101, heading to Florence. The temperature climbed to a very comfortable level. All happy to see 75 degrees again. Heading east on Highway 126, between Florence and the tunnel, my temperature display rose steadily to 105 degrees! Let me do the math for you here, that is a temperature swing of just short of 50 degrees in less that 1 hour! As a motorcycle training instructor, I am continuously education my students on the concept of Rider-Readiness. Being prepared for fatigue-inducing changes that occur during a ride is an important element of that message. My ability to focus on my ride, and the operation of my motorcycle, was moderately compromised on both ends of the temperature swing that day. I mistakenly assumed that as the day progressed it would only get warmer. I was wrong. So, what’s the message, or strategy? Be prepared! I wished I had brought along my liner and a warmer pair of gloves…. but wishing just doesn't cut it. Next time…..